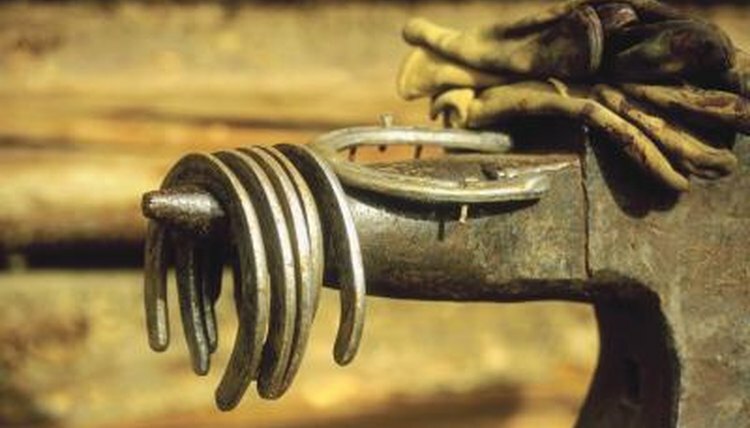 Farriers have been applying horseshoe to the bottom of horse's hooves for many centuries. Whether a horse is used for trail riding, working a ranch or jumping, shoeing is important to maintain balanced feet so a horse can keep up with the many demands asked of him. Farriers also use shoes to correct problems and keep the horse sound. The exact history and origin of the horseshoe is unknown. Even in ancient times, horsemen in Asia made booties from plant material and hides to protect their horses' feet. By the 6th and 7th centuries, horsemen in Europe were nailing shoes to horses' feet. Horseshoeing was a regular practice by 1000 A.D., by which time shoes were made of bronze. During the Crusades in 12th-century England, shoes were cast from iron and often were more valuable than coins cast from the same metal. By the 13th and 14th centuries, however, horseshoes were made in bulk and could be purchased ready-made. By the late 1800s, courses were available to teach farriers proper shoeing techniques. And in the early 1900s, many of the shoes we use today, such as aluminum shoes for racing, rubber pads and toe clips, were already in use. Today, horseshoes are most commonly made of steel. Old shoes are first removed with pincers, then the hoof is trimmed to the proper length using nippers. The farrier next trims the sole and frog with a hoof knife. A rasp is used to finish trimming and smoothing the hoof before a new shoe is put on. Once the hoof is balanced, the farrier will use either hot or cold shoeing to fit the horseshoe to the horse. The farrier nails the properly fitted shoe to the sole. The end of the nail is removed, then bent down with a clincher to make the edge parallel to the hoof wall. This ensures the horse will not cut himself on the nails. In hot shoeing, the farrier fits the correct size shoe to the horse, then heats the shoe in the forge and shapes it to be an exact fit. Once the perfect fit is attained, the shoe is cooled and nailed to the hoof. Farriers who use cold shoeing simply fit the correct size shoe onto the horse's hoof. Altering shoes without the benefit of a forge is difficult. On average, horses must be shod every six weeks. Horses may need to be shod earlier if a shoe is loose, if a shoe is overly worn or if the toe is overgrown. Specialty shoes can help maximize a horses performance in certain disciplines, help overcome and treat medical conditions or minimize effects of poor conformation. For example, racing plates are lightweight and made of aluminum to minimize the weight the horse has to carry. The egg bar shoe helps horses with navicular disease by increasing the heel's ground-bearing surface. Farriers may choose to pursue certification from an organization such as the American Farrier's Association. Farriers must demonstrate their competence in trimming and shoeing horse hooves and pass a written examination covering biomechanics, anatomy and physiology. In addition to certification, the AFA offers endorsements of specialized knowledge and skill in working with specific disciplines, breeds or activities.